I finished the full release on Normal a few days ago. It was very good! I think the cleverest design was the Quantum Chambers: a neat idea, and well executed. The two chase levels were also fun, and I think also novel for Galaxy mods. In general, I never felt lost, though there was plenty to explore. The difficulty seemed good overall; I managed all but the final level without in-level saving, and that might not have been so much due to difficulty as to me not wanting to do the platform ride every time I nudged a fire helix. The platform ride levels were again a cool new thing. I might be inclined to have them a bit shorter, but I don't know if you intended the levels to be played with ILS, so if you did, they're balanced perfectly fine. It looks like you had the beginnings of another one (Binary Circuits), but IMO it was wise to stick with the number of them you finished. Dynamo Deck was again very clever, with a difficulty appropriate for being so near the end, and the music was perfect for it. Also, I just now realized while glancing over the levels in the editor that the Extraction Core -- or X-traction Core -- is a giant X. Hehe This is the only level that I would like to see adjusted a bit. It seemed to have more repetition and backtracking than the others. It's not a bad level by any means; I've just been spoiled by the caliber of all your other ones! Unrelatedly, just because I'm curious: is there a meaning to the defense tunnel names? Introduction of new graphics was done well. The new backgrounds in particular are beautiful. 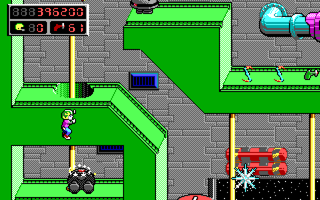 Diagonal rails and slippery slopes were tasteful additions that were well used in level design. And I'm sure it took some finagling to get new connecting/combination tiles between existing ones just right. As I'm writing this, I just saw that the fire helix against the left edge of the green wall in the Atomic Rails is a new tile. Impressive attention to detail. I just looked at the map and wow, that really puts into perspective just how massive this thing is. I finished the mod on Normal some days ago, I just hadn't taken the time to comment on it yet. So the mod is really awesome! The new sliding slopes are a cool feature. I love how lots of stages have specific puzzle themes to them, particularly in the four main arms of the Alphamatic (like one arm is full of on-rail levels). Actually, the rail levels themselves are a welcome addition. I hadn't considered it before, but, looking back, it's strange to think that there weren't any rail levels in the original gamessince plenty of other platformers have used them, and the capability was there. There were simple things, like that long tar pit in Keen 4, but nothing of this complexity and length. I'm particularly fond of the one that required Keen to hit switches to keep the rail going. Another thing that sort of wowed me was an early level, I believe it was the Quantum Chambers. It's the one where you have to finagle with the doors to go to different states of the same room. That was a really cool trick. It kind of reminded me of the old Submachine games. When this popped up again later on, with that whole big stage having four "states", that was pretty incredible (and intimidating!). I liked that there were bonus levels that the player isn't required to visit, something that Keen 5 lacked (except for the secret level). It's interesting that one of them is even entirely missable! According to the wiki, I guess there's a bonus stage, but I didn't find it - maybe I will have to look later... this mod is really tough in a lot of places though! And speaking of which, the mod required me to confront Robo Red in strange and scary new ways that I wasn't prepared for. I both hated it and loved it for how different it was. That spot with the poles and the rails? Pretty terrifying. The same goes for the Shikadi Master, to a lesser extent. It's nice to see these enemies being used in creative ways. I have to wonder... Why no Spirogrips? I'm not complaining by any means, though. I abhorred those things as a kid (not quite so much now). Keen's face looks kinda weird in the title graphic, but I get where you were going with it. The progression of the "Mars" song over the last few stages was a really nice touch. It definitely makes the final stages more impressive and daunting. Using remixes of the Keen 5 songs throughout the game was a cool choice - it was neat to hear new interpretations of them. The new Dynamo setup, at the end of the game, was an unexpected and interesting twist. I found several visual clipping problems, but I didn't bother to document any of them because I am the worst. I also found this, though. I'm not sure if it's a memory error or something, but, in this one big stage toward the end, I was in the tunnel (right pic) and suddenly Keen started being rendered on top of absolutely everything, including the foreground. I tried saving and loading and even rebooting the game, and this persisted with the save file. Eventually it corrected itself, much further on in the level, seemingly at random. I'm sure I could go on... If there's anything I forgot to mention, and I remember it, I'll come back. It's a really awesome mod, and thanks for putting so much time into it! I played through nearly all of the mod (although I seemed to have missed the secret level, assuming there's one since KeenWiki stated there's one) on Normal, and I've gotta say that this is really fantastic work overall! You did a very good job at this, Gridlock! The levels were very fun to play through, and had some very creative ideas that I would've never thought about until now (such as having the Volte-Face on rails, levels where you ride on moving platforms for most of the time, Power Grid, Cryptocorridor, and much more). The new graphics were also pretty nice to look at, and I really loved the music in the mod. There was one thing I was wondering about, though. Does the glass orb in the end of the final level ever go down? I fired every single shot I had at the orb, used the B+A+T cheat a few times to get extra ammo (the only time I ever used cheats in this mod), and the orb is still there. I even looked elsewhere in the level in order to see if anything changed (and nothing did, if anyone was wondering). I'm not sure if I accidentally triggered a bug that made the glass orb unbreakable or it just requires so much shots. I have saved in the level, so if you're interested in taking a look at my save file, Gridlock, then I could give it to you. Anyway, I'm looking forward to what will you make in the future, Gridlock. Ugh, this is unfortunately a bug that I was hoping people wouldn't run into. For some reason, on a small percentage of attempts, the QED patch fails to trigger its final explosion even when its health has been depleted. I'm assuming that the orb was pretty cracked at the end, even though it didn't get destroyed, right? So far, Levellass hasn't figured this one out yet. Hopefully, it can be fixed in a future version. a) Die, restart the level, and use cheats to get back to the top of the level. See if the QED fuse responds to shots. I've found that sometimes it'll break on the first shot, other times it'll still be glitched and won't take damage at all, and other times it'll behave normally. b) Use warp cheat by pressing F10+W (the text will be corrupted due to patching), then type the number 12 and hit enter. You'll be back in the level. Try destroying the fuse again. So sorry about that . Let me know if works. I promise there is a real, big ending. In-level saving is definitely recommended, though of course people are welcome to try making it through these levels on one go. The inability to include checkpoints in standard Keen 5 is an unfortunate limitation. Also, I just now realized while glancing over the levels in the editor that the Extraction Core -- or X-traction Core -- is a giant X. Hehe This is the only level that I would like to see adjusted a bit. It seemed to have more repetition and backtracking than the others. Ha, I thought about changing them to yorps. Though, I couldn't think of a decent explanation of how exactly yorps ended up on the station above Mars, so it was just easier to go with the Scotties again . Agree that there's not a lot of lore to go on with the Korath. I'm not a fan of them either. The main reason, though, is that the spirogrip's frames were recycled to create the QED sprites at the end of the game, so it's not even possible to put a spirogrip in anymore. Eh, yeah, would be open to improvements if anyone has ideas. I also found this, though. I'm not sure if it's a memory error or something, but, in this one big stage toward the end, I was in the tunnel (right pic) and suddenly Keen started being rendered on top of absolutely everything, including the foreground. This is another weird bug that eludes me. That's the first time I've heard of it popping up in Dynamo Guard Vault... the only other place I've seen it is the west defense tunnel. I have no idea what causes it. Yeah, the orb was very cracked. I decided to reload a save file that was set in the worldmap, right before the final level. I went through the final level again, and the orb was destroyed once it received some shots. The ending was very neat, it made me look forward to what will happen next. I had a score of 1,564,700 at the end. Hearing that there's an easter egg in the defense tunnel names and that there's a big secret kinda makes me want to play it again. EDIT: I started a new game, this time on Easy. I found a secret in the first level, with a screenshot of it here. Was that supposed to be the big secret you had mentioned? I forgot to mention in my last post that the dialog was amazing. As someone who doesn't usually care about the story in mods, I really appreciated the characters having personality. Gridlock wrote: This is another weird bug that eludes me. That's the first time I've heard of it popping up in Dynamo Guard Vault... the only other place I've seen it is the west defense tunnel. I have no idea what causes it. This happens in vanilla Keen 5 too, in the Regulation Control Center (image from KeenWiki). I have yet to find an explanation for why it only happens in certain spots and why it doesn't consistently start or stop. Did I not JUST post this? It happens when a moving Platform interrupts Keen's pulling himself up from a ledge sequence. During the sequence his foreground is set to 3, appearing in front of all tiles. At the end it returns to 1, but if the platform interrupts this, sending Keen straight to standing, this is skipped. I have noted where this occurs in the mod and DID send notes earlier during testing. In fact it seems none of my notes were read. Oh, I thought that was the explanation for why the orb doesn't break. Sorry for the confusion. Hey guys, I think the reason for the glitch where Keen appears in front of the foreground is because a goplat pushes Keen when he's climbing up a ledge. I'm not sure how I know this, the information just... came to me. - If you want an extended variation of Keen 5, The Alphamatic surely satisfies that. - Same if you want a clearly more challenging Keen 5 gameplay. - One thing this mod shows, is that you can be inventive with the gameplay, with no patching at all (except for what's required for supporting custom maps). This includes - how am I going to call them - these "transformations between rooms" (using plain doors). Another example is the ways these goplats and slicestars are used in a few levels, and also the robored. Yep - the robored! As for any issue: I do think the finale section is somewhat glitchy; Maybe there's some memory corruption out there. It did happen to me, too, that I could destroy the orb after just 1 shot (well, maybe 1-3). Also, when I destroyed the orb for the very first time, rather than getting the expected finale sequence, I weirdly got this error: "PageLayout: Text not headed with ^P"
Question: Does anyone have a save file around where the final QED orb infinite health bug happens? It figures that this bug has happened plenty before, but now when I actually want to get a save file with it happening I can't reproduce it (I've tried at least 10 times). Also, when I destroyed the orb for the very first time, rather than getting the expected finale sequence, I weirdly got this error: "PageLayout: Text not headed with ^P"
Good to know. And guess what, this is yet another pesky memory problem. The Keen engine for some reason uses this message when it has run out of memory to display the ending sequence as a result of needing too much space for music and images. Unfortunately, the amount of available memory isn't consistent each time the ending is loading, and it would appear that it's a bit too close here. I may have to try finding some creative ways to cut down memory more here. I'm guessing you're referring to standing on the flipping red platform below and shooting up? This has occurred to me, though I'm not sure if it's better to leave it in for creative players to exploit. Nope. There are indeed secret lives there (and some more you probably didn't find near there), but that's not what I'm referring to. It just might take... unconventional means to discover. It does so since it ends up overwriting the start of the ending text, the ^P, thus triggering the error. If this is a problem a solution may be to uncache everything before the game ends; I had this problem in a boss level I'm building, as the music is cached last it requires there to be twice the music chunk's size of memory available. However by uncaching everything, loading the music first THEN recaching everything (This required the boss to bring up a text window each time it started, but I made that a bonus.) I only needed free memory equal to 1 16x16 tile. (Going to the menu is also disabled during the boss fight, so no saves!) Since this would be before the game end it should be quick enough to do. The only problem would be finding the code the game uses to cache\uncache everything and space to insert it. The mod itself it's cool and everything, but I think it isn't really a sequel to Atroxian Realm. It's much more like a mini-sequel or a gold sequel to Keen 5 since there is nothing that is related from the prequel (Atroxian Realm).